Good morning! As someone who loves to eat I have a motto in life and that is: Never waste a meal on lousy food. In other words, if I’m gonna eat I want to eat well, otherwise it’s not worth the calories, the effort to prepare it, or the money spent to have someone else prepare it for me. I’m especially mindful of this when traveling, so I pay particular attention to restaurant choices while away from home. I research restaurants as diligently as I do hotels, because my other motto in life is: Why leave home for a bedroom that is anything less than the one I enjoy in my own home. Bottom line, I’m very discriminating in how I spend my much valued travel time and dining dollar. 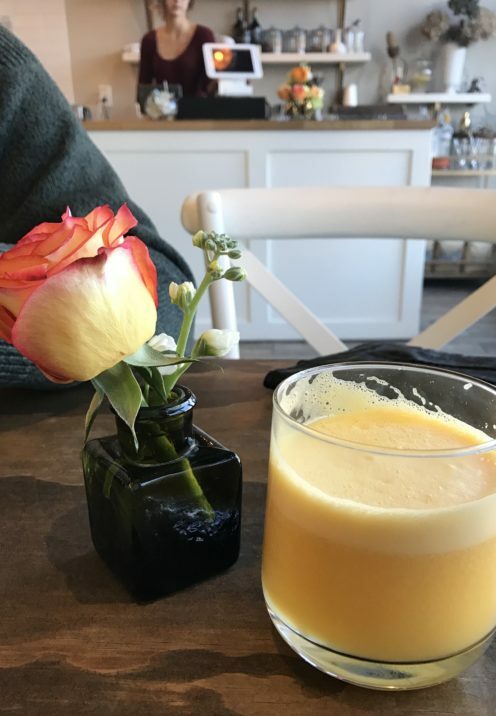 So, on a recent trip to Denver I wasn’t going to settle for anything less than Denver’s best breakfast spot, which in my opinion is a lovely little place in City Park West called Onefold. Onefold is a little gem of a spot situated on the edge of a mostly residential neighborhood just west of City Park, Denver’s largest park. This recently gentrified area seems to be enjoying a new vitality. 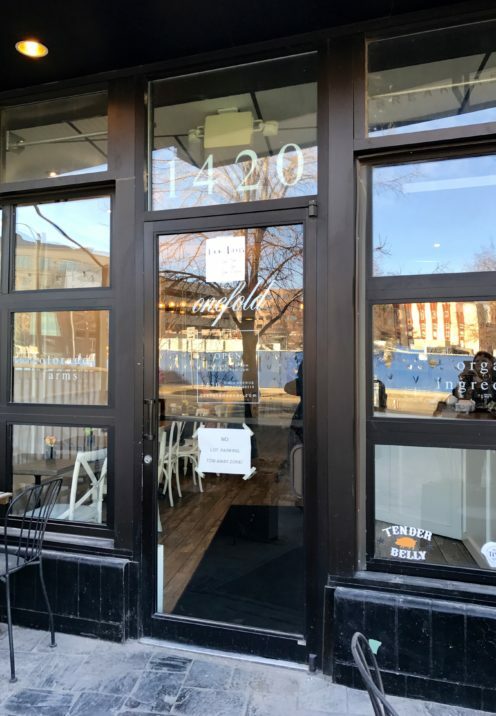 A youthful generation of mostly millennials have discovered the charms of the old Victorian homes that dot this part of Denver and are fueling the evolution of City Park West and its vibrant and growing restaurant scene. 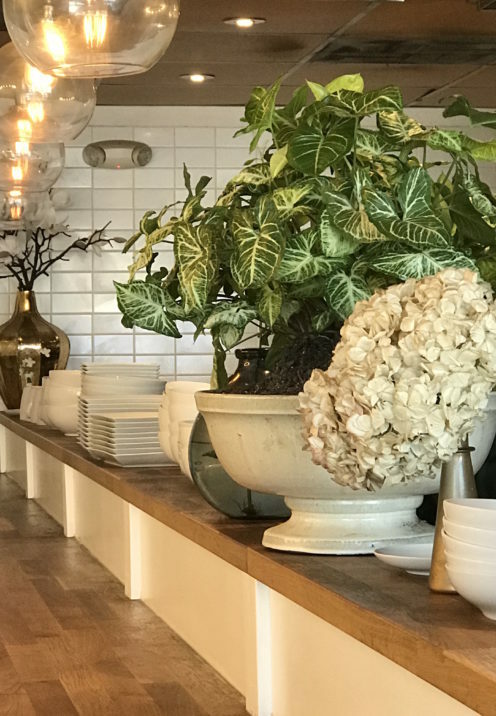 Among the very best of the bunch is Onefold, with its globally inspired menu that showcases the Chinese-American & Filipino roots of the talented owners, Terese and Mark Nery. 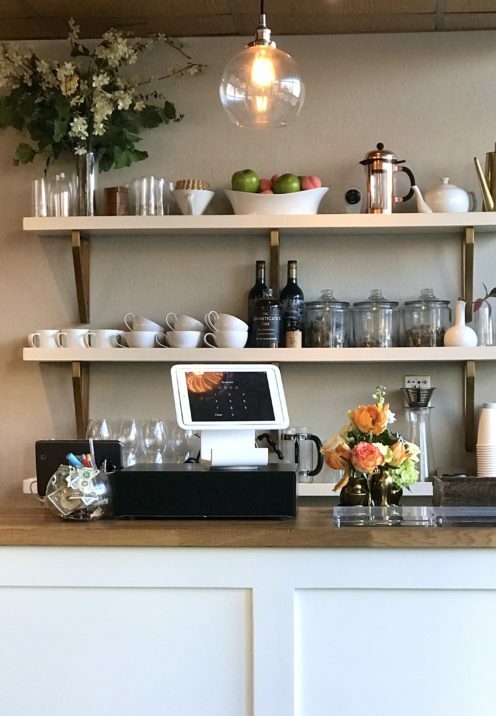 This simple but charming eatery is what my breakfast dreams are made of. Organic and locally sourced ingredients used in the preparation of a few dishes done very well. And it’s all served up in a cosy environment with warm hospitality that makes you feel welcome and comfortable. The kind of place that’s worth leaving the comforts of home for and then lingering over a great meal. 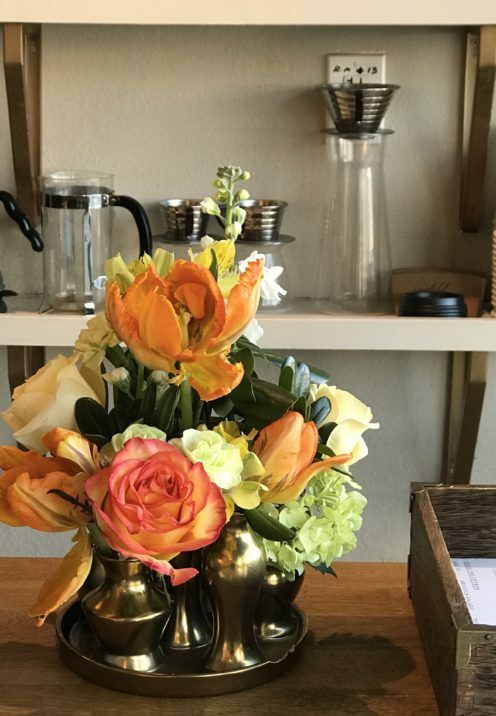 and the larger arrangements that help create an inviting ambiance. Here you get the best of both worlds, delicious food served in a great atmosphere. 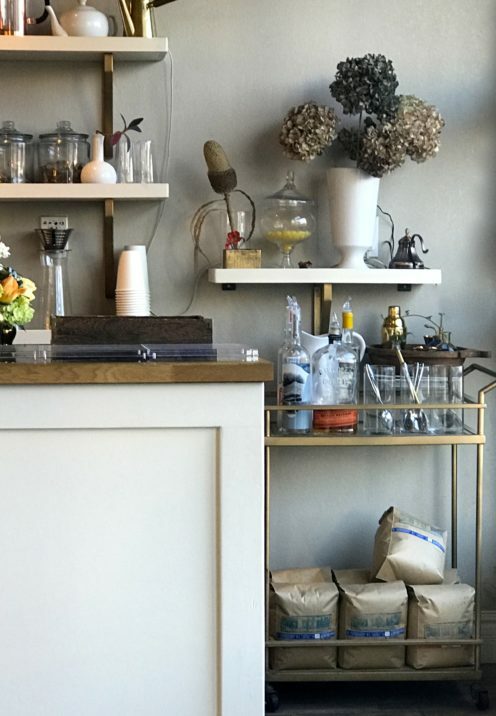 In fact, if I could design my ideal breakfast eatery it would likely look much like Onefold. 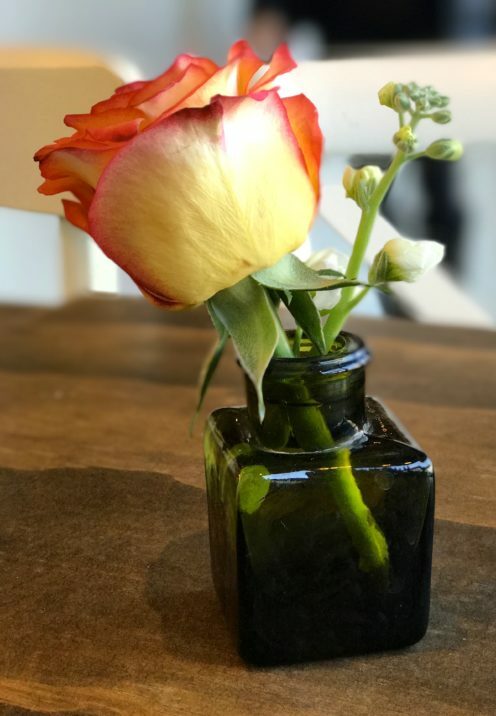 So, speaking of food, this restaurant has a motto they live by as well and that is one of creating “food with integrity.” They strive to prepare transparently simple food made with the best ingredients, prepared without sugar, MSG or GMO’s. Their homestyle food is inspired by family recipes which include the dish they are probably most well known for: Congee. Congee is a savory rice porridge that’s popular in Asian countries. Onefold tops it with a poached egg, house cured duck confit, green onions, salted ginger, tamari soy sauce and chili oil. Asian breakfast comfort food at its best. 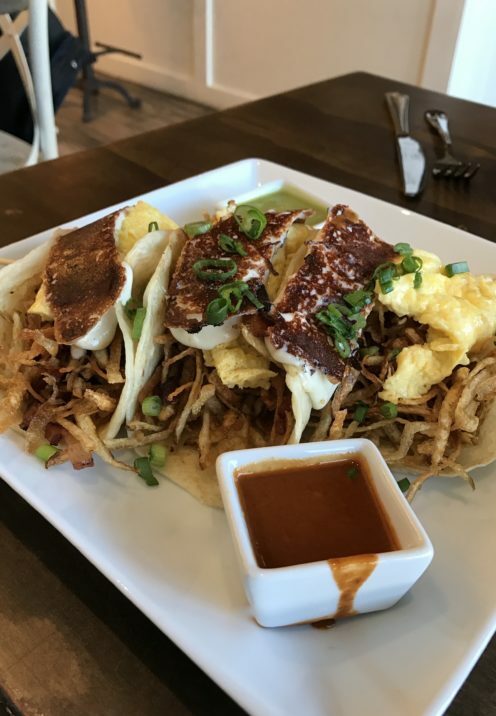 They are also known for their breakfast tacos where handmade flour tortillas are the vessel for tender belly bacon, ooey-gooey grilled mozzarella cheese, crispy shredded potatoes and eggs topped off with fresh salsa. 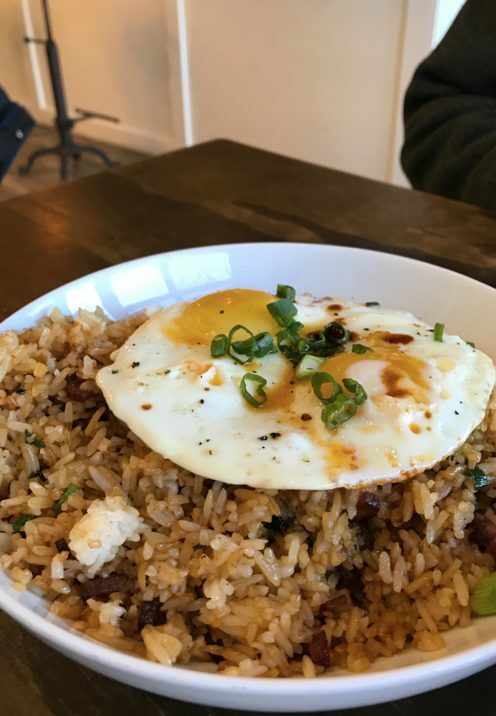 Also not to be missed is the Bacon Fried Rice made with more tender belly bacon and crowned with eggs fried in duck fat (yum!) and drizzled in chili oil. My husband thought he’d died and gone to heaven with this dish. 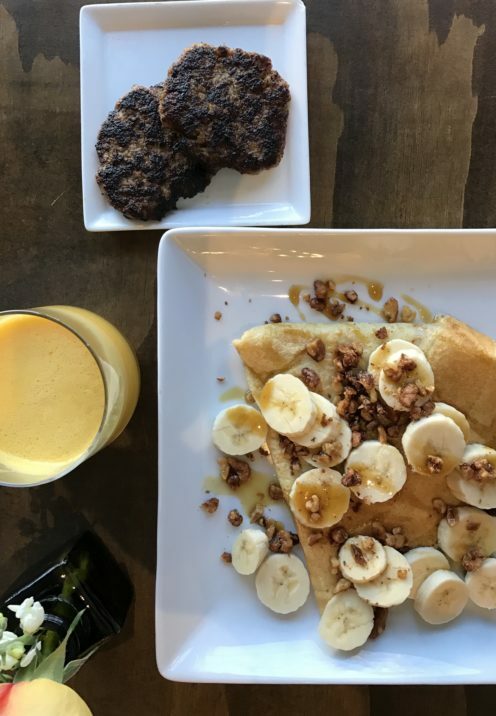 I ordered the crepes that are sprinkled with roasted organic walnuts, sliced bananas and real maple syrup. A side of fresh squeezed OJ also hit the spot. Onefold serves breakfast, brunch and lunch but on our recent visit they wanted us to tell our friends that they are now serving dinner. 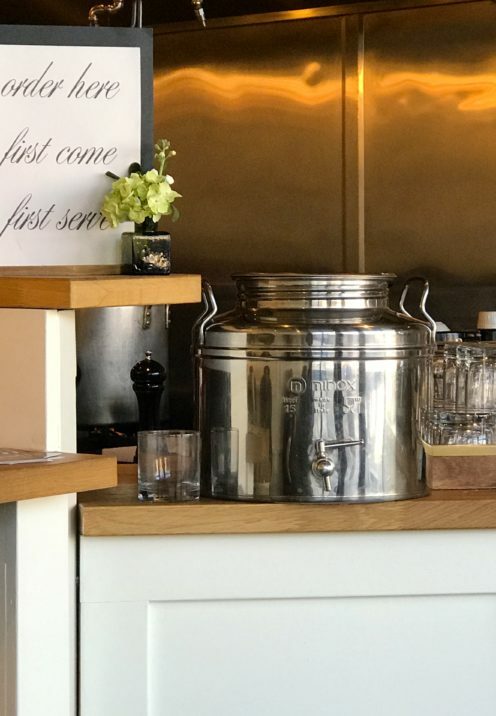 For dinner there’s a fun assortment of alcoholic beverages and beers offered from their bar cart along with a handful of small plates for the nighttime crowd.